Brough Superior SS100 motorcycle ridden by T.E. Lawrence to his death. It has, according to one authority, Royal Enfield brakes. 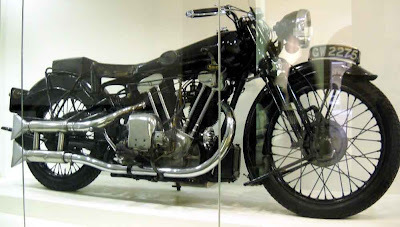 It is the Brough Superior motorcycle T.E. Lawrence was riding when he was fatally injured May 13, 1935. It is on display, not much the worse for wear, under glass at the Imperial War Museum in London. My wife Bonnie and I came across it separately during our visit to the museum this month. The museum had a full exhibit devoted to Lawrence of Arabia in 2005-'06. 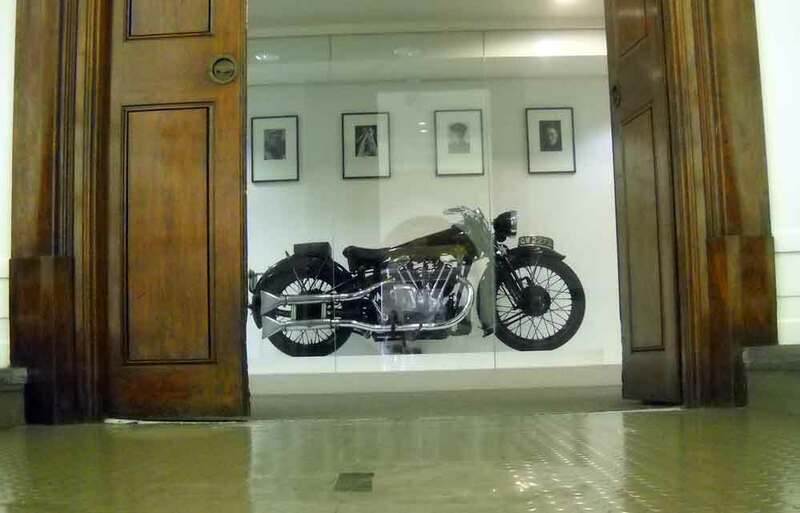 That only exists online now, but the Brough, privately owned, is on display. It is dramatically displayed. In fact, it looks almost regal through polished double doors. Lawrence's Brough is dramatically, perhaps reverently, displayed. Its link to military history is marginal, since Lawrence was a civilian by the time of his accident. He was a celebrity for his leadership in the World War I Arab revolt that threw the Ottoman Empire out of Arabia. In 1935, recently retired from the RAF, what he wanted to achieve now was fame as a great writer. He rode the Brough that fine spring morning to send a telegram and post a parcel. On the way back he encountered two errand boys and clipped the wheel of one of their bicycles. The resulting crash left Lawrence in a coma from which he did not awake. He was 46. 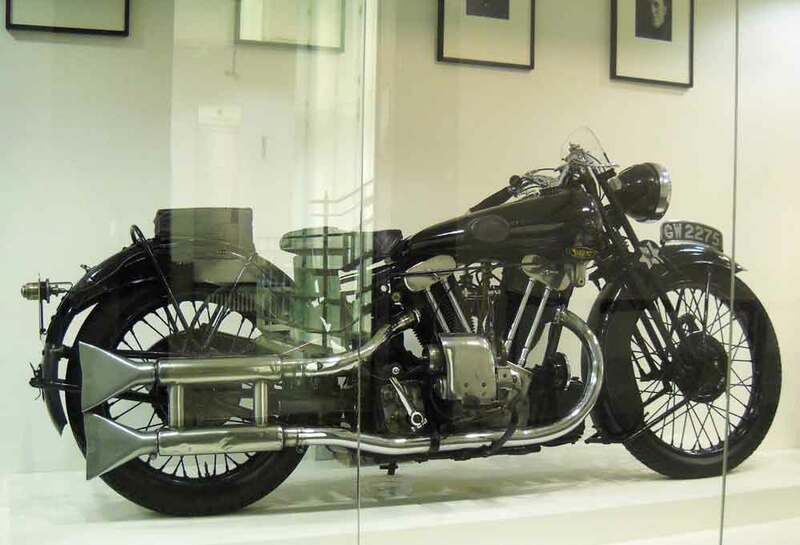 The Brough Superior is often called the Rolls Royce of motorcycles. Brough (pronounced "Bruff") Superior motorcycles were famous in their own day as well, for quality and speed. That said, they were built largely of parts made by other companies (thus the Royal Enfield brakes) and assembled by George Brough. Lawrence loved his, owning a total of seven in turn, and referring to each as "Boanerges" (Sons of Thunder). "The Road," his stirring account of racing his motorcycle against a fighter plane, can be read online. Seeing his final machine in the Imperial War Museum, preserved like a reliquary in a cathedral, is a bit chilling. 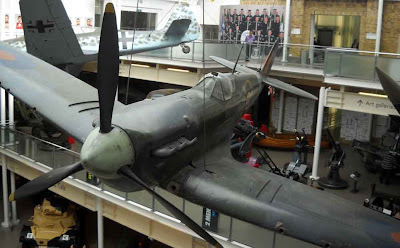 Battle of Britain Spitfire and Focke Wulf duel in the sky inside the Imperial War Museum. One of the reasons I go to museums is to see the real thing. Elsewhere in the Imperial War Museum is General Bernard Montgomery's personal M3 tank. The turret cannon barrel is a wooden dummy. 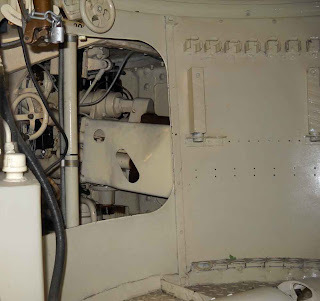 Having no turret gun left Monty more room inside the tank for radio equipment. is at bottom; through the opening the tank's main gun is seen, mounted in its sponson. 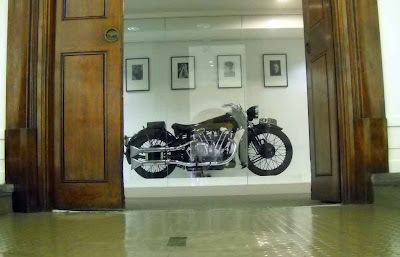 Interesting — but not quite so moving as seeing a relic of the world's most famous motorcycle accident. The mighty Boanerges is not a timid man's motorcycle. I've seen that bike in person also and it makes your jaw hang open for a few minutes. There is another Brough superior at the Bovington tank museum. Also try to see the Tate Britian and The Wallace Collection near Manchester square.